Well everything AND the kitchen sink. The last thing we accomplished in the kitchen before moving in was taking care of the Kitchen Sink situation. As with almost everything in the house it was all sorts of discombobulated. 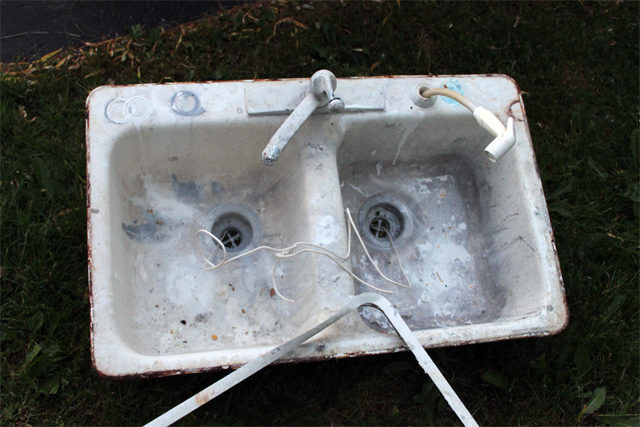 See we knew right from the start that we didn’t have the time or patience to restore or recover the cast iron sink, in the midst of home improvements, we used it as our ‘slop’ sink. As in- every paint brush, every gross mess, every dry wall patch cleanup was in that sink. As for removal we turned off the main water line, disconnected the drain/p-trap from the sink, disconnected the hot and cold lines, and removed the silver trim. 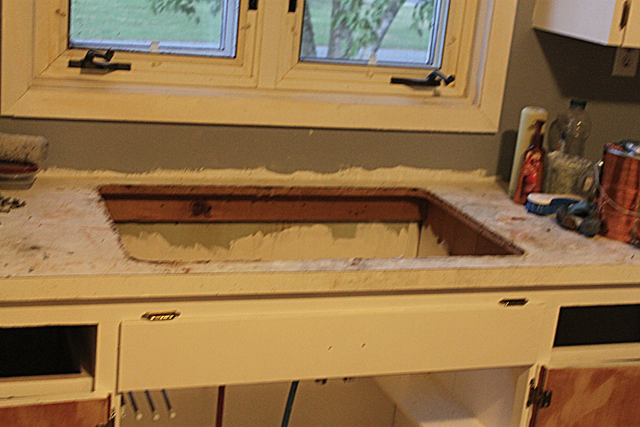 Then it came time to pry, starting with prying the sink from the counter top to remove the ‘seal’ aka caulking. Then came the actual removal which was a two person job and no easy task, one to pry the other to lift. 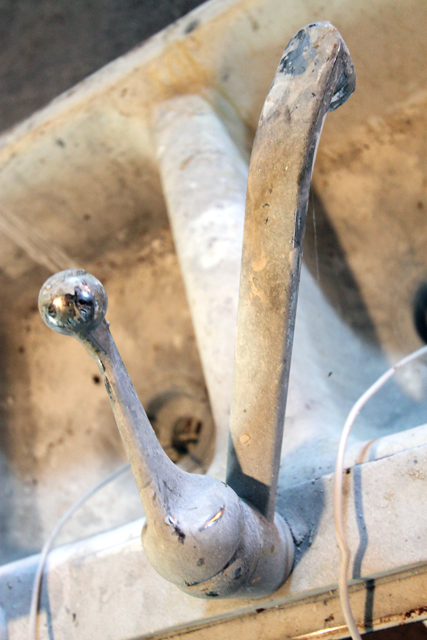 We found it helpful to use some heavy gauge wire we had lying around running under each drain. 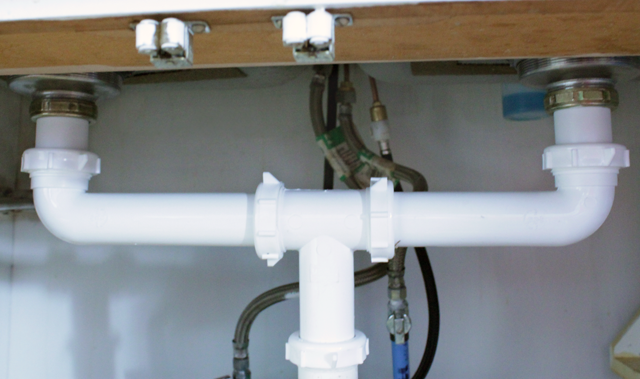 While we had everything open, we replaced the hot and cold water lines with PEX (left over from the bathroom) and the drain/extension tube and quarter vent (we had laying around) since they were grimy and old. 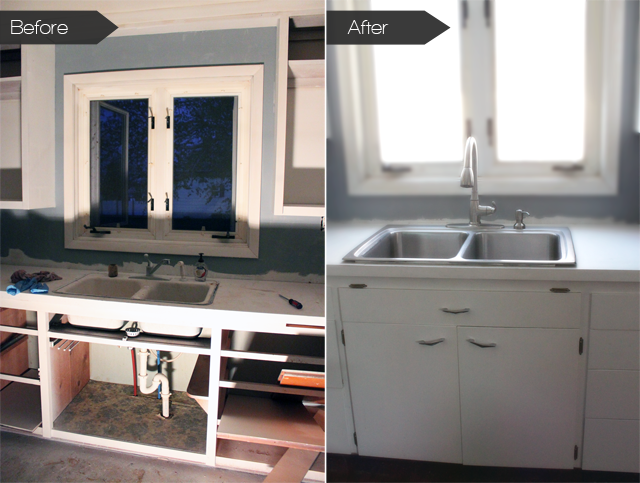 We replaced the old sink with a stainless steel sink found on craigslist for $20. 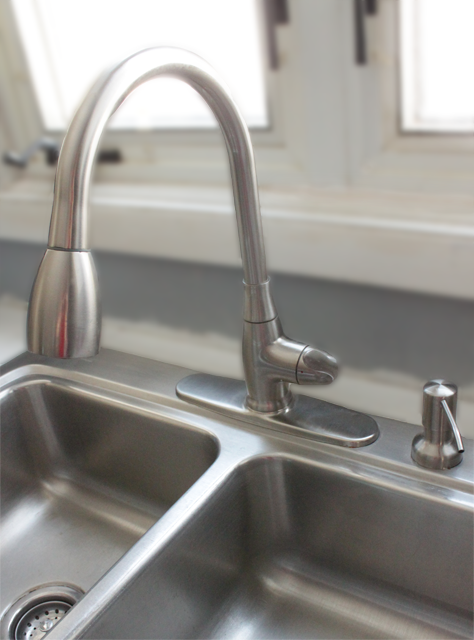 We also found a brushed nickel faucet on clearance on one of our Menards shopping excursions for $70. Since our faucet and sink didn’t come with a soap dispenser or plug we scoured Menards finding a soap dispenser for $20. The plugs were somewhere around $15 and for a little more we could have the luxury of dish detergent. 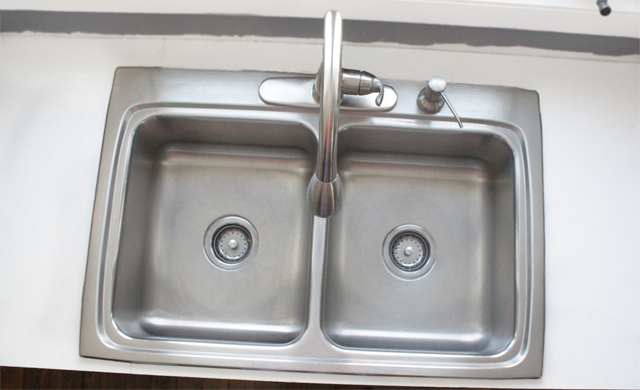 Since we haven’t finished the countertops yet, the sink sits a bit high and is slightly elevated. Either way, I’d say a sink upgrade at only $110. Considering the least expensive decent faucet we found was $131 alone. What do you think, a decent improvement on the cheap? Want to follow along with the Kitchen progression? Here’s the Prepping for paint, Painting Part 1, Repairing Drywall, Painting Part 2, Hardware Decisions, the Floor, Appliances, and the Countertops.